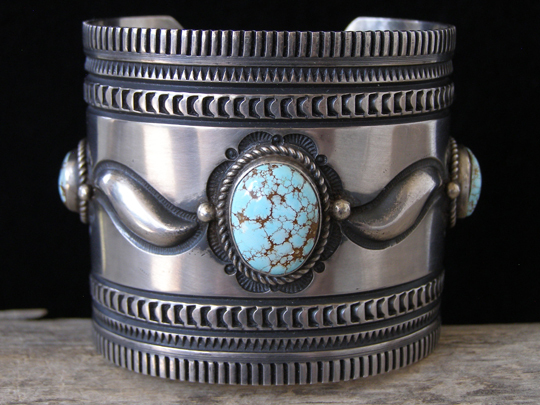 Albert Jake Number Eight Turquoise Bracelet size 6 3/8"
This wide, uniform-width cuff by Navajo silversmith Albert Jake shows his skill for making selective, restrained decorative elements speak volumes. Using a center oval and two free-form stones of natural, untreated Number Eight turquoise, he tied these stones together with repoussée S-Curves. Bands of stampwork mark the edges of the cuff and a very light brushing of the expanse of undecorated silver nicely softens the visual aspect of this cuff. There is nothing "overworked" about this cuff; it has a reserved, understated aspect. The years will build a patina on this cuff which will make it a thorough classic. **Note On Sizing**: This cuff is 2 3/16" wide. It has a gap of 1 1/8". Because of its very wide width, it will best fit someone who normally wears a size 6 1/8" or 6 1/4" bracelet in a one-inch wide bracelet. Hallmarked with A.JAKE and stamped Sterling. Stones: center 11/16" x 1/2"; left 5/8" x 7/16"; right 5/8" x 1/2"